Pittsburgh was amazing. It had its low moments, but what trip doesn't? This summer I'm working on me, so I apologize for a little of the craziness. The trip really solidified for me the reasons why I want to go into museum work. The Warhol Museum was perfectly laid out, a bit hands on, and overall brilliant. My only issue was that three galleries were closed, so we didn't see any Campbell's soup cans or Marilyn heads (but I've seen both). I was so excited to see one of his "piss-paintings" in person though. 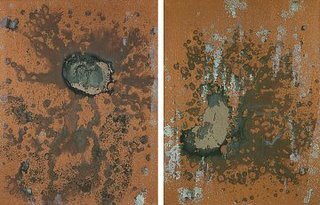 He got this brilliant idea to piss on a canvas that had been painted copper (I think), which then reacted with urine and made really neat organic colors and shapes. It sort of reminded me of the Gutai movement in Japan, with the hands on visceral creation of art. There was a great collection of paintings he did for children to look at, arguing that art was not high brow at all, and that even a child could get appreciation from art. He even hung them at a child's eye-level (my shoulder basically), and that's how the pieces were hung in the museum. This really touched me for some reason, that he thought about art, its audience, and how broad it was. Another one of my faves was the Silver Cloud Room, which is what the title implies. Juse a dozen silver clouds floating around a small gallery in which the museum visitor can walk in and interact with the clouds. I loved it. Seriously. My last fave of course was the photobooth in the basement in which I took some amazing headshots, and felt fabulous all the while. I seriously loved that museum to death. In addition to The Warhol Museum, we hit up two Pirates games (which they lost), but it was fun nonetheless. I finally got to see the "lemonade guy" my Dad has been raving about, and I nearly died. The view from PNC Park was unreal. Just a straight shot of the skyline as a backdrop from our seats. Good job picking the tickets out Mari!! We also went to a spa outside of Pittsburgh, and I got my first ever facial and massage and it was weird and oily and quite funny at times. The hotel was a totally gorgeous refurbished 19th century building with really comfy beds and it had this amazing porch with rocking chairs on it. It reminded me of Kentucky a bit, because it was all so lush and hilly. My favorite part of the trip, by a landslide, was Fallingwater. 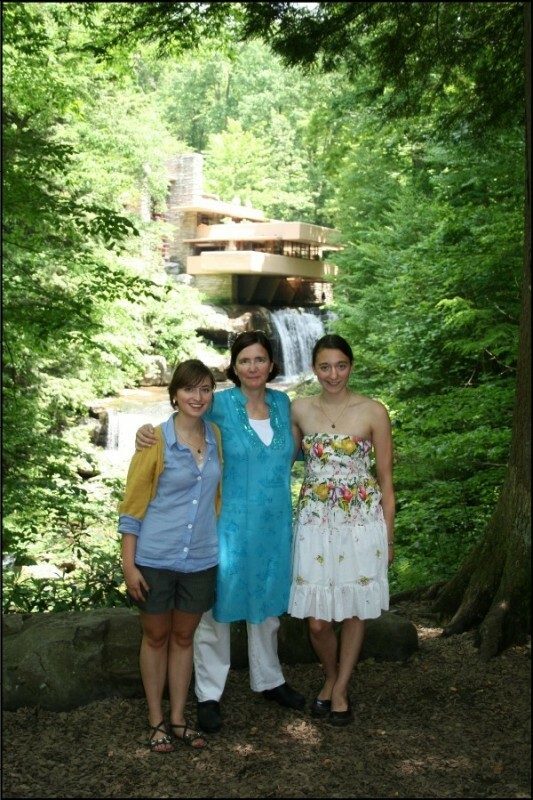 My mom, sister, and I have had this goal for years and years to go to Fallingwater, Frank Lloyd Wright's architectural masterpiece and we did it. And it was amazing. Actually there was no word for it. Amazing, incredible, fantastic, don't cut it. It was built in three years. It was built ontop of a waterfall. It cost a lot of money. He only went to college for two semesters, so he literally was an architectural genius (haha Leandra and Devin). He just thought it up you know? And the whole place was curated so well. It has ALL of the original furnishings and art that belonged to the owners that commissioned the home. So basically, you can't touch anything but it was one of the biggest treats for my eyes. Original Japanese woodblock prints, a Rembrandt, original Tiffany vases and lights, desk, shelves, and chairs made my the architect, artifacts from history... I seriously can't even remember beyond that. And the son was an art historian so he had one of the most amazing art history book collections that made my mouth water a bit. And we did a special tour that included a sweet little brunch, and since it was his birthday on the day of the tour, we sang happy birthday to Frank and had cupcakes. Swoon. Basically I need to write on here more and I've been doing lots of things that keep me busy (like reading books and having a band-crush on Metro Station). So sorry sorry sorry. OH OH and Friday 12-2 p.m. was the best I've felt in a long long time. She was right about dropping expectations. P.S. Last night's double party and naked bike-ride was amazing. New favorite corner: STATE and DIVISION. Here's to kissing randoms from Indiana who eat double cheeseburgers in Jewel parking lots, riding the train for free, and Miguel from California who had the pretty eyes and the stupid shirt. P.P.S. CAN SOMEONE PLEASE WATCH THIS MUSIC VIDEO AND TELL ME WHY I LOVE IT? ?